Vee and Sanrio should get a by eye over this. 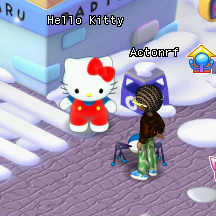 While I had fun at Hello Kitty’s Supercute Friendship Festival, there is a dark cloud as I read the Facebook accounts. I guess “operational reasons” mean they were losing money and decide to cut their losses. It sad that more fans in North America will not see this wonderful event. I also feel Vee and Sanrio going to get a Black eye how poorly they are handling the cancelation. In look back at other stops for the Hello Kitty’s Supercute Friendship Festival, I see a pattern that led to the shows demise; the shows were played in arenas. It must be very expensive to rent a coliseum or arena when Hello Kitty doesn’t have the draw like Ringling Brothers Circus, Disney on Ice and Monster Truck Jam. They would have to sell out to keep the show in the black. Even when Portland Oregon was announced as one of the stops , I had reservation in the back of my mind the tour would be successful. Portland and Seattle would make or break the Festival. In Portland the show was struggling in Portland, as evidenced by the show tick were being sold at a discount. What Sanrio should had scaled down the show. For example Hello Kitty’s Supercute Friendship Festival space could have easily fit part the exhibit hall of the nearby Oregon Convention center and possibly at a cheaper rate. They could have scaled the show for smaller areas were the fan base is not as large. Or a similar interactive event like Hello Kitty Labs or Black Wonder event. The time: 31 July to 2 Aug 2015; 100pm Session. Hello Kitty’s Subercute Friendship Festival is touring North America until end of this mounts. There were five sessions available , I selected the 1:00pm to 5:00pm. I started at 1:00pm because I bought a ticket for the Red Bow premium package. This includes and exclusive photo op with Hello Kitty, one hour early entry, ( the main events did not start until 2:00pm and lasted to 5:00pm), and early shopping time. 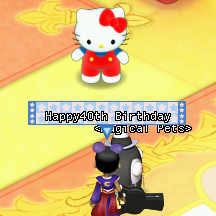 Today is Hello Kitty’s 40th birthday. 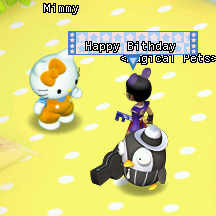 It is my tradition to fire Up Hello Kitty Online and say happy birthday to Kitty White and her sister Mimmy. I know Kitty get all the attention and Mimmy was revealed later. No need to write a long retrospective . There a lot of that in the media because of Hello Kitty’s 40th anniversary and Kitty Con 2014. One new story did get my ire, Business Week’s piece Hello Kitty a Victim of Disney’s Frozen Juggernaut. This is pure poppycock. Hello Kitty has been around for 40 years. Frozen is hot in 2014 but I guarantee you Frozen will be in the Yard sale bin five years later. Toy Story and Lilo and Stitch were the big thing years ago, but where are they now, are they big as Hello Kitty? Come back to this article in ten years and tell me who remembers Frozen. There still will be Hello Kitty fans who grew up with her. I noticed one thing with curt rumblings at Kitty Con and the Hello Kitty Men project: can 2015 be the year of the Male Hello Kitty Fan? I hope so. Toys R Us Closing Another Sanrio Mistake?